Register Log In Primarily Petroliana Shop Talk Forums General Petroliana Discussion Wayne 861 twin pump? 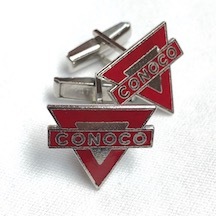 One of our forum colleagues Ric Esgar ("DuceCpe" user name) was kind enough to send me some gas station photos from his old Conoco Magazines, as we are both Conoco fans. In this station shown, they appear to have a Wayne 861 twin pump in the back. I have Jack Sim's latest Gas Pump Bible and he doesn't show the Wayne 861 twin. He seems to show an awful lot of twin pumps, but not for the Wayne 861. Is the pump in the photo highly uncommon, so much that Jack doesn't include it in his book? I know that a fair number of Conoco gas station photos show the regular Wayne 861 pump, so I am not thinking the pump is rare at all. Any thoughts? Book says twin is a 865. I didn't see the Wayne 865 twin pump in the Jack Sim book. Maybe I am like a guy looking for something in the fridge when my wife tells me, "It is right there in front of you". Can you kindly send a photo of what you are looking at? They’re around, but rare like all twin clockfaces.